High Definition. Built Tough. 2MP Imaging. The TX242 IP is a 1080p high definition, intelligent, wide dynamic range IP camera that is compact in size and light weight. The camera produces stunningly clear images in the most demanding conditions. Wide Dynamic Range technology provides class leading imaging performance. The image capture and processing system provides high-quality pictures with enhanced dynamic range that significantly improves image quality in scenes consisting of both bright and dark areas. 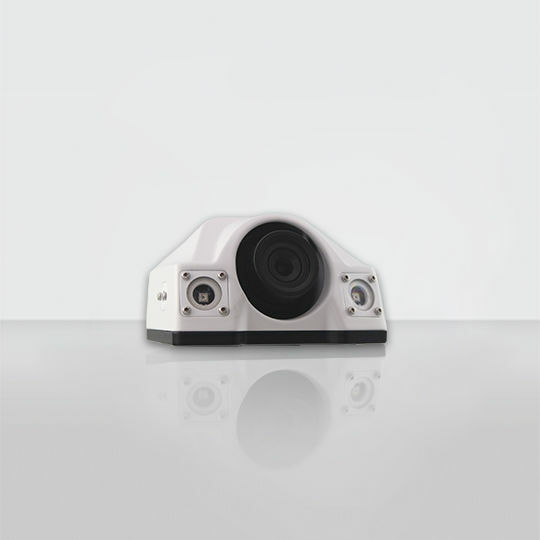 Built rugged, the camera is designed to operate over the extreme temperatures and vibration found in vehicles. The TX242 IP metal housing makes the camera vandal resistant and when installed virtually immune to tampering. 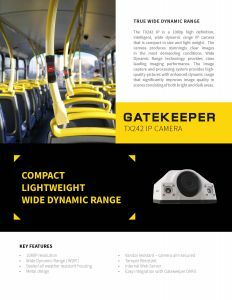 The TX242 IP camera is plug and play compatible with Gatekeeper’s G4-Series IP DVRs with power over ethernet (PON 12VDC) and uses industry a standard RJ45 connection (no proprietary cabling) which allows the use of Cat 5 cabling between the camera and DVR. Cable length of 15’, 30’ 45’ and 60’ with strain resistant over molded connectors are available. Not only is the camera constructed of metal but there are set screws that when tightened, prevents the camera aim from being tampered with. This is important for installation where the camera can be accessed. In order to help reduce camera vibration, a rubber mounting pad is supplied. The rubber pad is installed between the camera base and the mounting surface. The rubber pad conforms to the camera base for easy alignment and quick installation.